The easiest to grow of all onions, these onions are also known as Egyptian and top-setting onions. They grow in any soil with reasonable drainage, but if you want big fat bulbs then dig in compost and horse, cow or sheep manure a few weeks before planting. Grow from bulbs planted with just the top poking out of the soil, or from single bulbils planted just under the surface of the soil, in a position with full sun. Space plants about 40cm apart and they will grow to be about 60cm tall. Bulbs can be dug up about 5 months after planting. Save some bulbs for replanting or just replant the bulbils and eat the bulbs. There seems to be some variation in flavour of the bulbs, some being more mild and sweet and others stronger. There are also types with more red than brown skins. 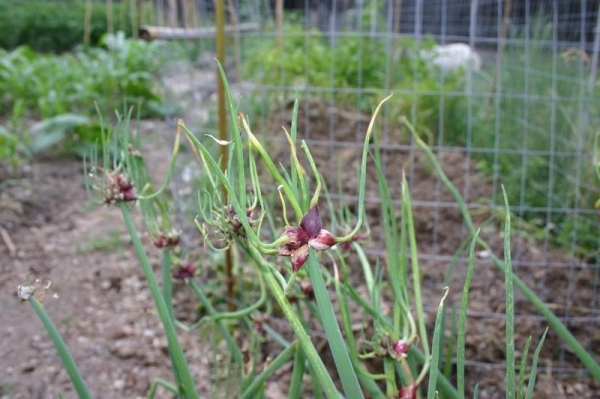 Both bulbs and bulbils have similar onion flavours and make an excellent substitute for brown onions in any dish.